One who is dying begins to live. One who begins to live, dies. People weave in and out of each other’s lives, stopping for a time and then moving on, leaving something of themselves behind, adding something from those met. And all the while, The Spectre awaits. The Grand Hotel, by Luther Davis, with music and lyrics by Robert Wright and George Forrest, is a place that exists in the heroin dreams and imagination of a German doctor, a survivor of WWI, forever changed in body, mind, and spirit by the horrors he encountered in that brutal “war to end all wars.” In the hotel of his mind, people’s lives intersect, choices and decisions are made, and lives are changed for good and for ill. It is 1928 in Berlin, during that very dangerous, decadent time between the end of the war and the rise of the Nazis, just before the Great Depression. The country is suffering tremendous inflation, with many desperate for food while a few profit immensely. In the Grand Hotel, we meet all kinds--the penniless Baron on the make, the over-the-hill prima ballerina and her long-time companion, the poor typist who comes to the hotel to work for the wealthy businessman, and the Jewish accountant who wants to experience what the wealthy take for granted. As the mind of the doctor vacillates between hope for mankind and deep despair, the creations of his imagination intermingle with each other in a phantasmagoric stew of greed, lust, fear, desire, longing, and occasionally, joy. This rather grim tale that has some wonderful comic moments is gorgeously staged at the Festival Theatre at the Shaw Festival by the creative team of Eda Holmes, Director; Paul Sportelli, Music Director; Parker Esse, Choreographer; Judith Bowden, Design; Kevin Fraser, Lighting; and John Lott, Sound. The stage is set with square, internally lit columns that change color to reflect mood, a grand staircase, a huge crystal chandelier on the floor, and gold chairs hanging willy nilly. As the doctor speculates on the fate of humankind, the hotel comes to life. The chairs take their places on the floor, the columns light up, the chandelier is lifted to the ceiling in the center of the lobby, and the very professional staff assist the incoming guests. Each guest then experiences a personal or moral crisis that reflects the tortured thoughts of the doctor. The cast is excellent. Michael Therriault, who was outstanding in last season’s Me and My Girl, and as Scrooge in A Christmas Carol, is at his playful best as the accountant Kringelein in the number “We’ll Take a Glass Together” with the Baron. James Daly does a fine job as the young impoverished Baron experiencing an integrity crisis. Deborah Hay as the aging ballerina, Grushinskaya, has the beauty and grace, as well as the sadness and longing, of a woman who has devoted her life exclusively to her art. Vanessa Sears is sweet and lovely as Flaemmchen, the young typist who must make a crucial decision. Jay Turvey is genuinely creepy as Preysing, the morally deficient businessman. And Steven Sutcliffe hovers over it all as the tormented Colonel-Doctor. While there isn’t a killer song that people hum on the way out of the theater, I particularly like “Love Can’t Happen” at the end of Act One by the Baron and Grushinskaya: "Love can’t happen quite so quickly, not unless I dreamed you beautifully and sweetly,” and I thoroughly enjoyed the upbeat jazzy tunes. 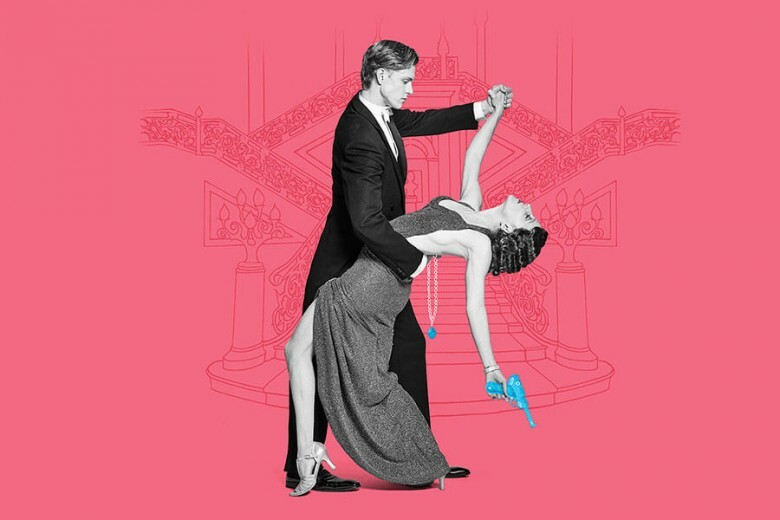 The Jimmys, hotel staff played by Kiera Sangster and Matt Nethersole, have two outstanding song and dance numbers. They are delightful and very fun to watch. 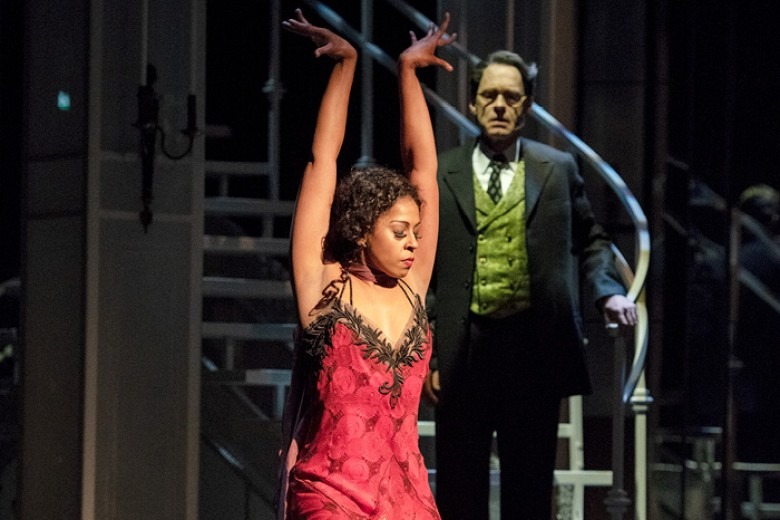 Another standout number is “Bolero,” by the company, with Kimberley Rampersad beautifully dancing the dark and seductive Spectre. 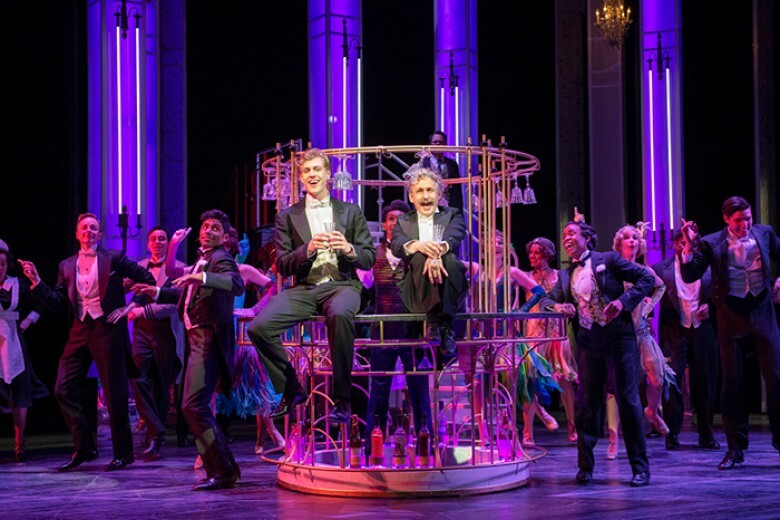 Grand Hotel, The Musical, while not a musical for the ages, has much to recommend it--a very talented and diverse cast who make the most of a less than scintillating book, sumptuous costumes, excellent production values, and some terrific singing and dancing.